A tree commemorates the coronation of King George VI and Queen Elizabeth in 1937. The coronation of George VI and his wife Elizabeth as king and queen of the British Empire and Commonwealth took place at Westminster Abbey, London, on 12 May 1937. George ascended the throne upon the abdication of his brother, King Edward VIII, on 11 December 1936, three days before his 41st birthday. Edward's coronation had been planned for 12 May 1937 and it was decided to continue with his brother and sister-in-law's coronation on the same date. 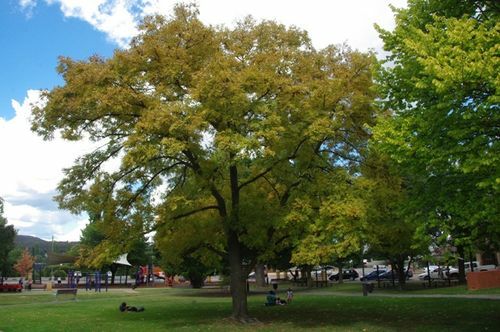 A civic ceremony in Belmore Park, which will probably include the planting of trees in commemoration of the Royal accession, will now supplement the two services' arranged by the Goulburn Churches in honour of Coronation Day. "I think there is not one alderman or citizen who does not agree that a city of Goulburn's importance should, in some way, celebrate an event that probably occurs two or three times in a century," declared Ald. T. P. Manion, in submitting this proposal to Tuesday's special meeting of the Goulburn City Council. Goulburn Evening Penny Post (NSW), 6th May 1937.